Ever been annoyed by someone tweeting far too much and spamming up your timeline? If the screenshot below is anything to go by, users of Twitter’s website may not have to worry too much about that any more. 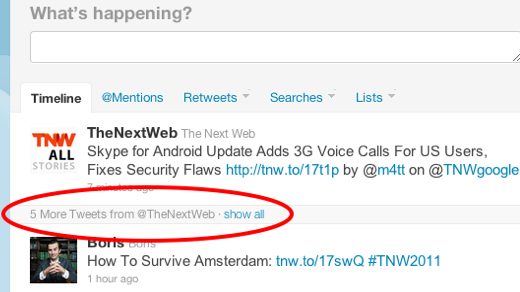 As you can see, this account, which is only following three people and is one of many belonging to The Next Web, has seen five posts from @TheNextWeb in a row – and Twitter’s collapsed them down to one, with the option to expand to view all. If this is an old feature, it’s certainly not one that’s crossed our radar before. That said, once you follow more than a handful of people on Twitter, it’s unlikely to ever crop up as you’ll rarely see a row of tweets from the same user. We’re told that there’s no third-party script involved here – this is a genuine feature running on Twitter’s site. New or not, it could well be a useful feature for newcomers who may be overwhelmed by tweets from noisy users, making it hard for them to see the value of their timeline. Hidden tweets are just a click away, so it’s not like this is a major hassle. Just don’t tell our own Brad McCarty, he took Facebook to task for a similar – albeit more ‘intelligent’ – feature just the other day. We’ve approached Twitter for some background on this ‘hidden tweets’ feature.